Equities struggled on uncertainty in a largely lacklustre volatile trading week, the BSE Sensex declined 95.21 points to close at 34,046.94 and the broader Nifty slipped 32.70 points to finish at 10,458.35. The truncated week saw the selling pressure loomed the key indices despite robust quarterly GDP data, which was duly sidelined. Investors were looking for clear direction as the trading momentum marred by worries on overshooting of fiscal deficit target, hawkish US Fed rate hike views in the midst of revelation of more public-sector bank frauds. The country's GDP recorded a five-quarter high growth of 7.2 per cent in the October-December on good showing by key sectors like agriculture, construction and manufacturing. The market got off on strong start lifted by positive global market only to turn volatile for rest all other three sessions with PSU Bank continued to bore brunt on fresh disclosures by scam-hit Punjab National Bank (PNB) along with HealthCare and Metal indices buckling under selling pressure. The market remained closed on Friday on account of 'Holi'. The Sensex started the week higher at 34,225.72 and hovered between 34,610.79 and 34,015.79, it closed the week at 34,046.94, showing a modest loss of 95.21 or 0.28 per cent. 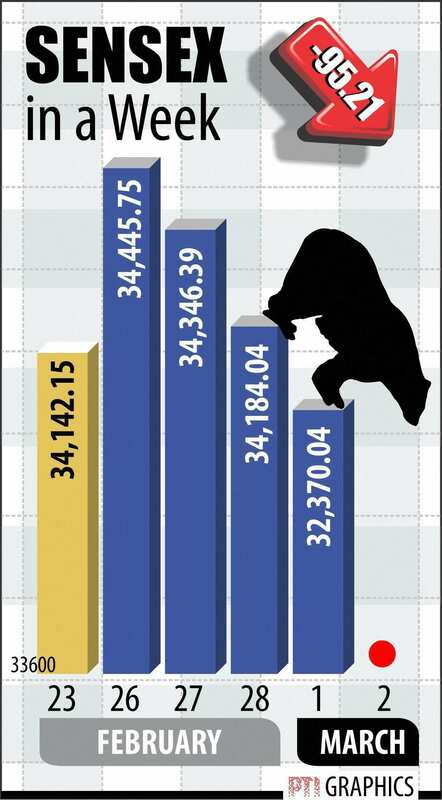 (The Sensex ended gained 131.39 points last week). The Nifty also resumed the week up at 10,526.55 and traded between 10,631.65 and 10,447.15 before ending the week at 10,458.35, showing a loss of 32.70 points, or 0.31 per cent. Selling was led by Metal, Banks, HealthCare, PSUs, IT, Teck, FMCG and Power sectors. While Buying witnessed in Auto, Oil&Gas, Capital Goods, Realty and Consumer Durables counters. The Broader midcap saw substantial selling activity, while smallcap shares saw miniscule selling. NEXT STORY: 7th Pay Commission report: Government employees wait, but will PM Modi implement it in this state?